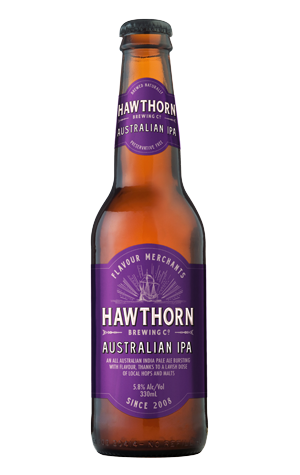 The biggest beer to come from Hawthorn at the time of its release is another one that wasted little time garnering garlands. An IPA made with all Tassie hops – four varieties of them – collected a gold medal and trophy at the 2013 International Beer Challenge in London shortly after release. It's easy to see why with the copper body created with Crystal and Munich malts giving the beer a caramel base upon which the wealth of fruity, juicy hop aromas and flavours come into play. Look out for everything from the tropical and grassy to a touch of the herbaceous and stone fruit too. It's balanced, it's tasty and, while not the sort of IPA to knock your palate into the middle of next week, has a solid enough bitterness to back up the malt sweetness.